Prudence Athearn Levy and husband Josh Levy. Food that’s worth it takes longer to prepare, Prudence Athearn Levy often tells her four-year-old son Kyle. Taking time to slow things down makes the experience worth the wait, whether that means brewing loose leaf tea rather than the bagged version or in the case of Mrs. Levy’s family, watching the carrots grow in their backyard of Morning Glory Farm. Mrs. Levy and her husband Josh Levy are putting that theory to practice in their new business at Vineyard Nutrition, consulting clients on how to take a few extra moments to relish simple food rather than fear its complexities, and step away from the processed foods and so they can do it themselves. 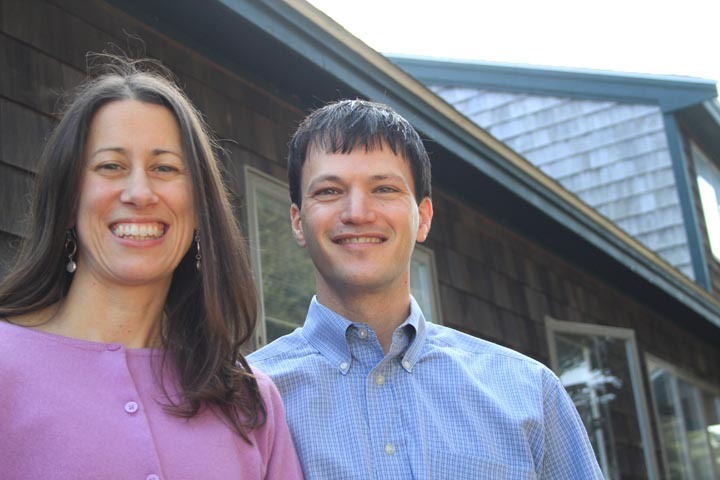 The Levys bought the Edgartown business from longtime nutritionist Denise Guest and began seeing patients earlier this month. The Levys’ philosophy goes beyond reaching for fruits, vegetables and whole grains rather than processed foods and sugars, although it’s a part of it. They emphasize taking the time to sit down, take the pace down a notch and find a connection with food. It’s a homecoming for Mrs. Levy, who grew up just a mile down the road from her new office on Cooke street in Edgartown. Her parents, Jim and Debbie Athearn, own Morning Glory Farm. From explaining to customers at the farm stand how to incorporate chard into their diet to teaching families how to make it delicious, Mrs. Levy easily incorporates her farm experience into the couple’s nutrition practice. Finding a connection to food was second nature to Mrs. Levy growing up in the fields of Morning Glory Farm and as the farm stand manager interacting with customers. She took that passion for food with her to Colorado State University, where she met Mr. Levy while completing their masters degrees. Connecting food and nutrition was always something she was interested in. The Levys, both registered dieticians with masters degrees in human nutrition, plan to expand the business beyond one-on-one consultations to include cooking classes, refrigerator and cabinet overhauls and working in the schools. Mrs. Levy said being near family was the biggest reason for their move back to the Island. She said that their children, Kyle, four, and Judah, two, are ecstatic to be living in Edgartown. After successful stints at hospitals and private practices in Boulder, Co. and Portland, Me., Mr. and Mrs. Levy decided it was time to return home. The trick is to get people excited about their food, starting with kids, Mrs. Levy said, and to improve their relationship with it. Mrs. Levy and her family were always enthusiastic about the food they ate. The Levys described their refrigerator as overflowing fruits and vegetables, plenty of color, yogurt, and cupboards packed with canisters of different grains and nuts. They take time in the morning for breakfast with the kids, sometimes slow cooked oatmeal with apples, nuts and flax seed, other times whole grain French toast with extra eggs and fruit. It’s a morning ritual they hope to inspire other families to do. The Levys teach skills that make recommendations seem not so daunting and the healthier options appealing. Plain quinoa grain could be as appealing as cardboard to some until you add something like avocado, tomatoes and olive oil, a salad the Levys sent their kids to school with one day last week. Food can be a scary thing for some people, Mr. Levy added, whether it be how it makes them feel or how it looks, but to get over that fear they recommend getting your hands dirty in the kitchen. One quick tip is as simple as using Sundays to your advantage, and preplanning for the week ahead. Nutrition is only one piece of looking at the whole health picture, Mrs. Levy said, and working with other health care providers is an important connection to make. The Levys’ work with pre-diabetes and diabetes patients to change their eating patterns allowed those patients to transition off of medicine and naturally lower their blood sugar and carbohydrate levels. In their work in hospitals and private practices the Levys said they’ve seen more children with cases of diabetes and obesity at younger ages, and the only way to combat that trend is to stop it as soon as possible.